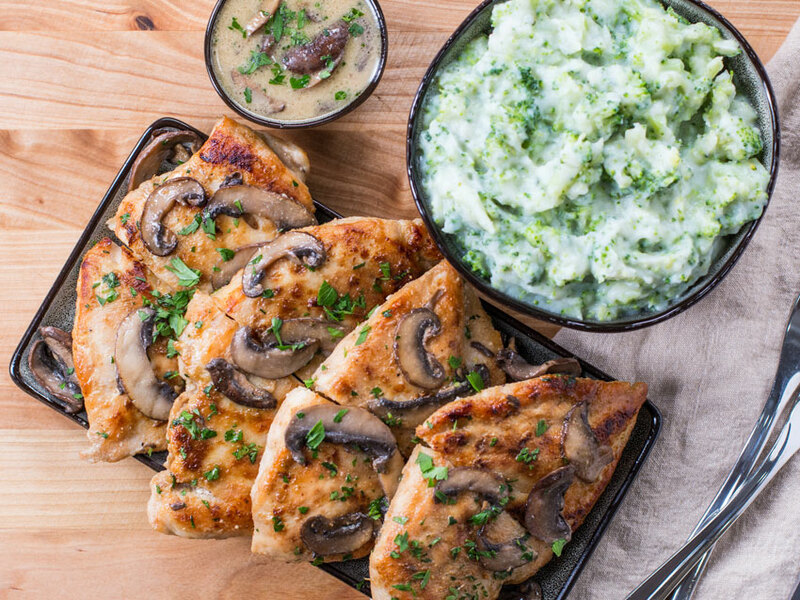 Spice crusted creamy mushroom chicken breasts served with cauliflower & broccoli mash. This healthy meal prep recipe has spice crusted juicy chicken breasts with a creamy mushroom sauce. This recipe is unique because the cream of mushroom sauce is dairy free, I used coconut milk and chicken stock. The chicken has so much savory flavor that you don’t have to worry about the sauce tasting like a coconut, but of course you can always use heavy cream and the sauce will turn out great. The key is too really take the time to caramelize the mushrooms, watch how I do this in the video below. Don’t salt the mushrooms until after they have caramelized, otherwise they will release a tons of water and end up boiling in their own juices instead of getting butty, brown, and golden. The mushrooms have such a savory, meaty flavor once they are carlemized, yu are going to love it! If you are looking for a low carb version of mashed potatoes, you gotta try my tasty mashed cauliflower with some broccoli folded in. 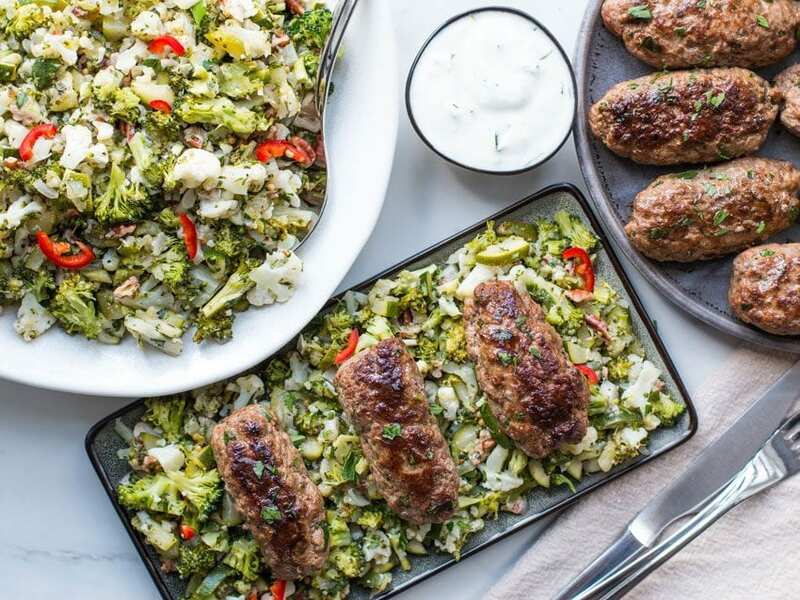 This recipe is the best way to get some veggies into your diet and even fool the kiddies into eating their veggies. You can even add a big handful of grated parmesan or pecorino romano cheese t this mash, aged cheese like that only have 20 calories and 1.5 grams of fat per tablespoon. The mash cauliflower get so whipped airy, and creamy once its buzzed in the blender or food processor. But, I also have a recipe for roasted cauliflower mash, and oh boy, the nutty flavor of the roasted cauliflower makes the mash irresistible! So you can roast the cauliflower in this recipe, along with the broccoli, just make sure to add some liquid to the blender so everything will turn into a mash, like warm milk, buttermilk, or chicken stock. I am kind of the master at making chicken meal prep recipes, I have dozens of them on my blog. 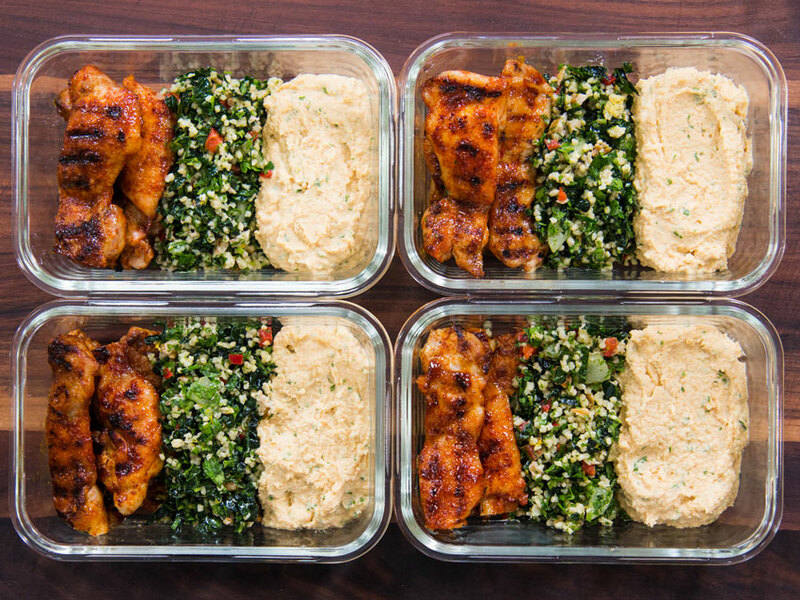 This chicken recipe makes 5 servings of meal prep for the week and will last in the fridge the entire time. Make sure t check out heating and storage instructions down below the recipe. 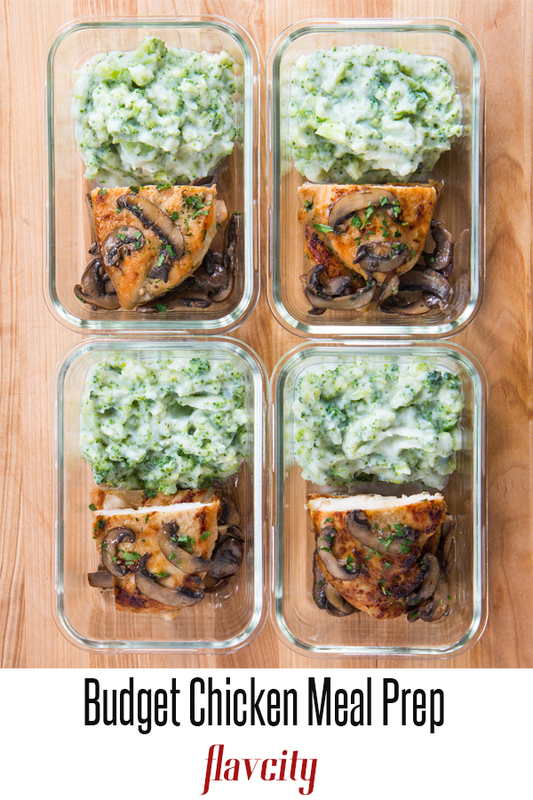 This meal prep for chicken recipe has two layers of flavor, the fennel spice rub and the cream of mushroom sauce. Make sure to follow my keys for making the perfect chicken breast, you gotta make sure the chicken is pounded thin, have a hot pan, and allow it to rest before cutting, all of that good stuff is in the recipe below. 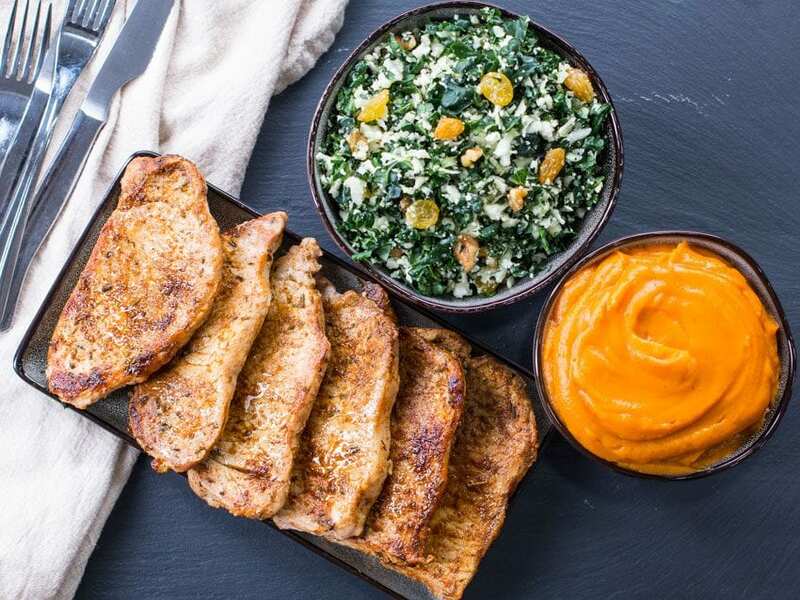 I understand that chicken meal prep can get boring, there are a lot of bland recipes out there 😉 But my meal prep recipes are full of flavor and creativity, which is why people love my YouTube channel! Make sure to subscribe via the video below this post. It’s light coconut milk, I just did not specify in the video. The sauce will be more creamy if you use full fat coconut milk, as long as you don;t mind the additional fat. 1/2 cup each of coconut milk and chicken stock. Okay, thanks! Love your website, I have shared it with all my friends! You Rock B.P… love this meal it’s awesome…. I didn’t want to open a new can of coconut milk so I just used 1/2 cup of half and half. This recipe was freaking delicious. So flavorful!! Is the cheese ok for Whole 30? Hi Bailey, if you are following the Whole 30 diet strictly, it does not allow for any dairy. So, I’d skip if doing Whole 30. However, I like this cheese because it’s a hard, salty sheep’s milk cheese that only has 7 grams of fat per ounce of cheese. Yes, just make sure it is unsweetened and unflavored almond milk.